Arriving on the top floor of “The Gallery at the Historic Museum of Natural History” is a bit like stepping into a fairy tale: There’s a 24-foot illuminated steel Eiffel Tower replica discovered at a Paris flea market, an iridescent gold-coffered ceiling, reproductions of heritage olive trees, and sparkling chandeliers. And even though this is a furniture gallery created by Restoration Hardware (now branded simply as RH), most of the items mentioned above are not for sale. They are part of a dramatic two-year transformation of the historic landmark at 234 Berkeley St. that is intended to bring a new type of retail experience to the Back Bay when the store opens Thursday. As part of a major makeover, architects stripped back decades of structural modifications made to the 150-year-old building, such as auxiliary mezzanine levels and pedestrian elevators, to open up the 40,000-square-foot space and make the original vaulted ceiling visible from 70 feet below. 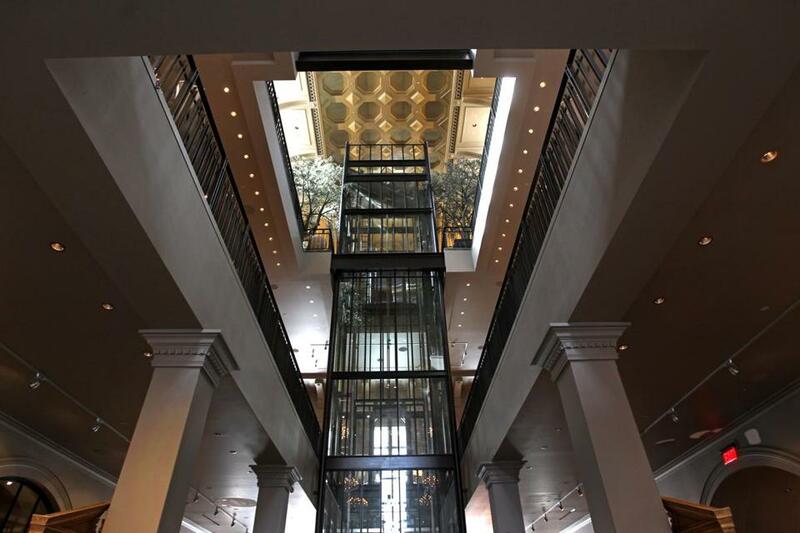 The focal point of the central atrium is a traction and counterweight elevator, with its steel-caged glass cab inspired by the iconic model in the Bradbury Building in Los Angeles. The third floor — described as an indoor conservatory and park — showcases RH’s outdoor furniture collection such as a $1,470 Provence wicker sofa and $1,895 trickling fountains placed on decomposed granite that looks like sand. A 14-foot-long antique Ma(i)sonry Napa Valley wine bar hauled in by a crane will be used to sell customers California vintages by the glass. The nearby “Billiards Room” features a refurbished vintage Brunswick table for shoppers to play pool and 1950s RH leather Copenhagen chairs that cost about $1,800. In the adjacent “Music Room,” $895 riveted mesh chandeliers hang over a 100-year-old beer bar salvaged from a local pub. And yes, it will be a working bar. “There are theme parks and then there’s Disneyland. Disney creates magic and inspires people to dream and feel differently. I think this is something that feels very different than any retail experience people have seen,” said Gary Friedman, RH’s creator and curator. The Boston site, once home to the New England Museum of Natural History and more recently the luxury goods purveyor LouisBoston, is the largest and most significant design gallery RH has opened to date. It features more than 7,000 items for sale, including merchandise from RH’s first Baby & Child design showroom on the East Coast. The three-story building is just around the corner from the space Restoration Hardware vacated during the recession, but it is worlds apart from the knobs, hinges, and knick-knacks that the California retailer built its reputation on. Carlos Alberini, RH’s chief executive, said the company has altered its real estate strategy, replacing undersized sites with larger “galleries” — a word the company favors over “stores” — to complement its evolution from a hardware seller into a luxury lifestyle brand that provides home design inspiration and products. RH has opened four other galleries, in Texas, Arizona, and California, and in each location, revenues have increased between 60 and 90 percent compared to the old stores, according to Alberini, handily beating targets of $850 in sales per square foot. RH has high expectations for the Boston home furnishings emporium and anticipates drawing customers from all over New England. The Gallery at The Historic Museum of Natural History is the latest and most complex collaboration between RH’s Friedman and design architect James Gillam of Backen, Gillam & Kroeger Architects, a California firm that also created the striking pavilion of glass and steel at the Newbury Street entrance. The outdoor landscaping preserves the original flowering magnolia trees while adding brick paths that will eventually wind through an outdoor sculpture garden. “This property has been so exclusive for so many years. What RH did is to bring back that broad appeal so many people will feel warm and welcome,” said Joseph P. Nevin Jr., senior principal at Bergmeyer Associates, the architectural firm of record for the project. During the renovation, workers found the original winder staircase hidden behind walls. The staircase is now completely exposed through steel and glass archways, winding and reflecting its way in framed mirrors mounted on the walls. There were hiccups, of course, along the way. RH was excited about its reinterpretation of an 1892 traction and counterweight elevator, but local safety authorities were less enthusiastic. So the retailer made some design changes that pushed back the original planned opening on Dec. 12 — chosen for its 12-12-2012 lineup of numbers. Also, the 24-foot Eiffel Tower model purchased in Paris was sent in three separate pieces, but the base never arrived. The company had to hire steelworkers to recreate the structure’s bottom. The entire building is brimming with French influence — maps of Paris, Provence outdoor furniture collections, French library shelving, along with 18-foot antique mirrored archways on the second floor that reflect 12 sparkling crystal chandeliers reminiscent of the Palace of Versailles. 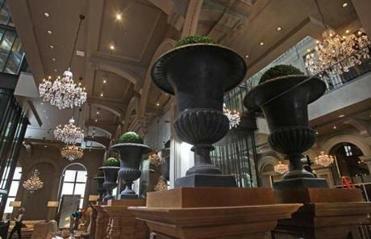 Could it be too opulent for Yankee consumers? Friedman brushed off suggestions that shoppers might find it difficult to adapt the grandiose space to their more humble homes.